Exercise physiology, psychophysiology, neuromarketing, and more! 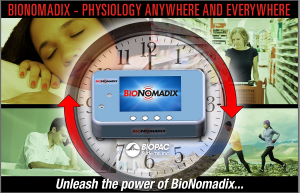 BIOPAC® provides a wide range of hardware solutions with data logging options for use in life science research.exercise physiology, psychophysiology, neuromarketing, and more! 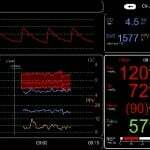 These systems record and analyze a variety of physiological parameters in either data logging or telemetry modes. Use the hardware with AcqKnowledge® for its wide range of data scoring, measurement and analysis tools, signal conditioning options, stimulus delivery and control functionality, plus synchronization options for stimulus presentation, virtual reality, video monitoring, and GPS tracking. Compact wearable physiological signal amplifier system that records up to 32 channels of high-fidelity wireless data. The perfect tool for applications that demand greater degrees of subject freedom and complex experimental design. The BioNomadix® Logger is the perfect tool for applications that demand greater degrees of subject freedom and complex experimental design. The BioNomadix Logger wireless, wearable physiology data recording system is the industry’s only system that delivers a comprehensive, 24-hour data logging solution in an easy-to-use, easy-to-wear package. Get the real-world data your application demands. Wirelessly record physiological data from up to three dual-channel wearable BioNomadix Transmitters plus a built-in accelerometer, as subjects freely and naturally live their lives—the BioNomadix Logger truly delivers “physiology anywhere.” The compact Logger device provides a color display for visual feedback, speaker for auditory feedback, vibration for haptic feedback, voice journal for participant comments, event markers, and alarms. Mobita® is a compact wearable physiological signal amplifier system that records up to 32 channels of high-fidelity wireless data. Data can be recorded live into AcqKnowledge® or logged for later upload. 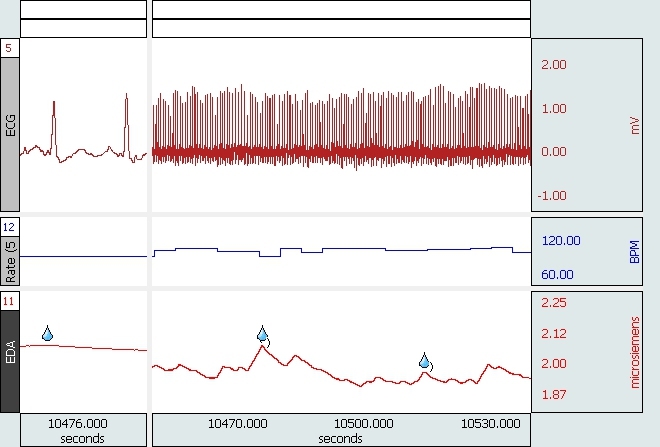 Easily switch between live or logging modes to suit your research protocol. After recording, use the full suite of AcqKnowledge automated routines for data processing, analysis, and reporting. Ideal for 32 channel EEG recordings, medium density EMG recordings, and any biopotential application that demands subject mobility and data logging. 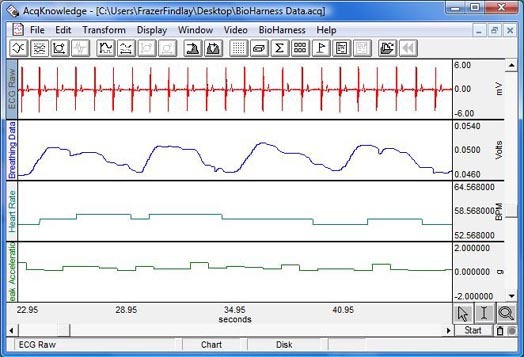 BioHarness™ with AcqKnowledge® software is a lightweight portable biological data logger and telemetry system. 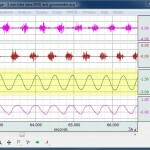 Monitor, analyze and record a variety of physiological parameters. BioHarness operates in Bluetooth transmitting mode for live viewing of data or data logging mode. Ideal for exercise physiology, sports conditioning, human factors, public health, and psychological studies. Data Channels: Breathing. RR Interval, Heart Rate, Respiration Rate, Skin Temperature, Posture, Vector Magnitude, Peak Acceleration, Breathing Wave Amplitude, X/Y/Z-axis acceleration min and peak, and, in live data streaming mode (transmits via RF), raw ECG. 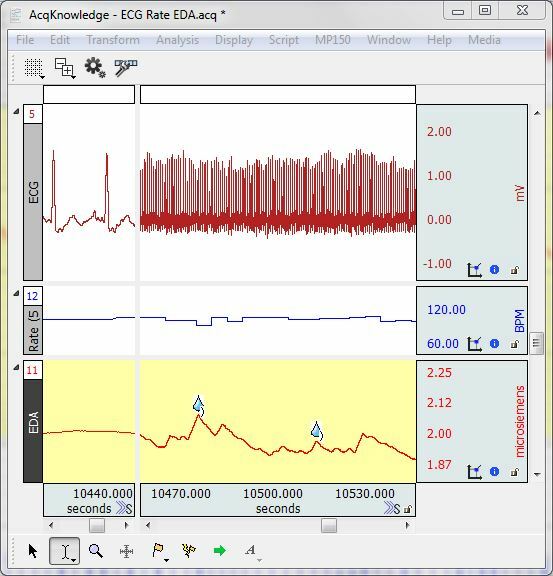 BioHarness™ with AcqKnowledge® also has a live data streaming mode (transmits via RF); the live mode can display raw ECG in addition to the channels listed above.